Sandy Blythe commenced his Bachelor of Education (Physical Education) course at the Ballarat College of Education (BCAE) in early 1981, completing his studies on time at the end of 1984. There would have been nothing special about that under normal circumstances however, Blythe was severely injured in a three-car accident midway through his course, in December 1981. The accident left him a paraplegic. After spending six months in a rehabilitation program at the Austin Hospital, Blythe returned to his studies. In his final year he demonstrated the high degree of determination that was to become his hallmark by achieving straight As. Locals from Blythe's home town of Derrinallum, Victoria recall him as a talented young sportsman who excelled at running and cricket, but especially Australian Rules (AFL) football. He was understandably devastated about his football prospects following the car accident as he had been training with the St Kilda Football Club, and was on the verge of a promising AFL career. Nevertheless, Blythe immediately displayed the kind of courage and determination that epitomises the Olympic spirit when took up (and began to devote a significant amount of his time and energy to) the sport of wheelchair basketball. When he completed his B.Ed. Blythe moved to Perth, Western Australia to continue studying and it was there that he became more active in wheelchair basketball. He subsequently went on to take part in several Commonwealth Games and World Championships, and four Paralympics: he was co-captain of the Australian team (the Aussie Rollers) in their gold medal win at the 1996 Paralympics held at Atlanta, USA. After starting his own business Disability Dynamics, Blythe joined a firm called Morris-Walker Disability Management to further improve the profile and public awareness of people with disabilities. 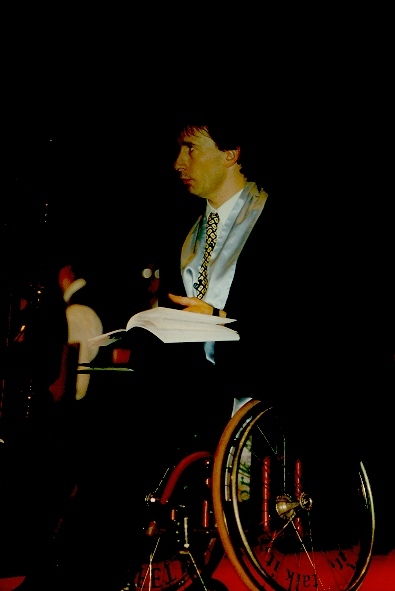 He was a much sought-after public speaker, and one of his major tasks was to ensure that the Sydney 2000 Paralympics ran smoothly and received the public attention it so richly deserved. He later formed Blythe-Sanderson Disability Management in partnership with Andrew Sanderson. Blythe's former lecturer at university, Professor Laurie Prosser described him as a 'tough, unrelenting on-court competitor with a great capacity to bond a team'. He was passionate about his sport and despite claiming his body was tired from years of rigorous training and competing in 1996, he continued to push on. He reached the pinnacle of his wheelchair basketball career when he played for Australia in front of home crowds at the Sydney 2000 Paralympics. Sandy Blythe died at Melbourne in November 2005 aged 43 years.